Searching for a game to play with a couple of friends? Well then look no further because Move or Die is just the thing, and even more. This game will test your friendships to the brink of even ruining them. 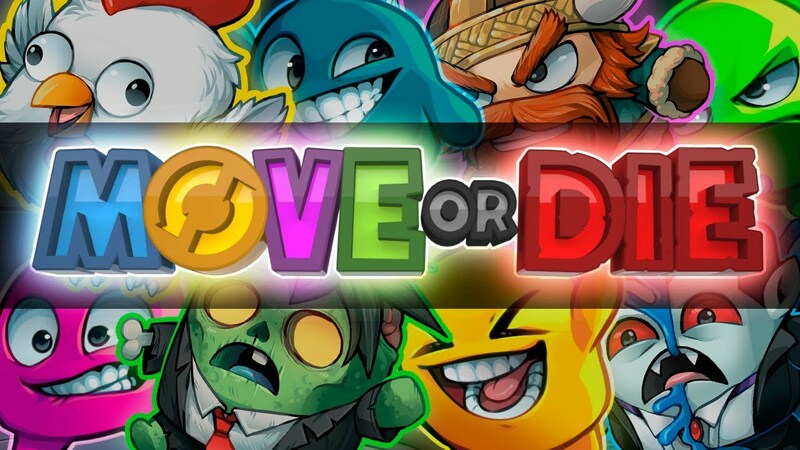 Move or Die is filled with many fun games that require you to act fast and prove to your friends that you’re better. Each 20 seconds, the mechanics change and random mutators will spice things up even more! 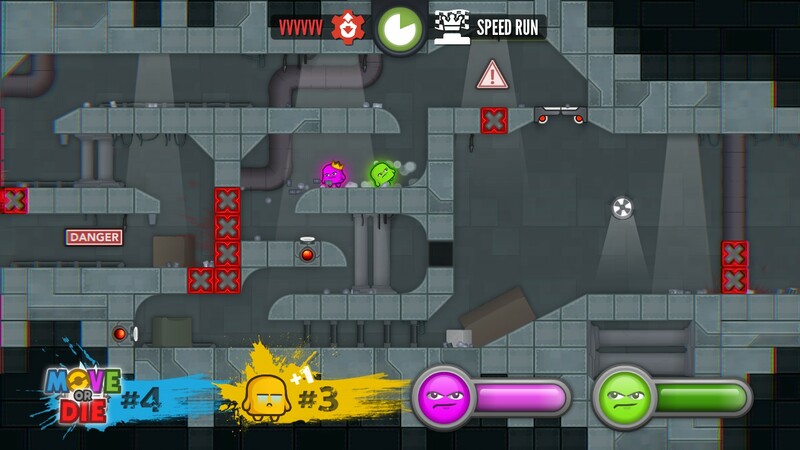 Get ready to test your mettle in this fast-paced 4-player friendship-ruining game. Move or die doesn’t have any story elements. This game revolves around playing minigames in a fast pace with friends, other online players or against some AI-controlled enemies. The purpose is to win the most minigames in a specified amount of time. This game uses some simple cartoonish graphics. Each stage is built up by blocks. Red blocks will hurt and kill you when you touch them. The participants will each have their own color that identifies them as that color. You can customize your character with new outfits, after you’ve earned some new outfits in loot boxes that are earned by leveling up. These vary from funny costumes to outfits that will give your character the look of known cartoon characters like Rick from Rick and Morty. A small colored edge will still identify you as the player with that color. All the minigames will take place in one screen. Each minigame will change the layout of the screen to be in line with the next game. When you start Move or Die, you will instantly be asked to choose your narrator. This game offers a lot of different narrators, including very evil sounding ones or funny ones like a Japanese narrator. In the menus, party-like music filled with drums will be heard constantly. This music can get annoying while listening to it when not playing. But when you’re playing with friends, you won’t even notice the repeated music because it will be dimmed every time a game ends and you’ll be too busy trying to win the games. The music fits perfectly with game’s genre as it’s joyful music that gets you going in these types of games. 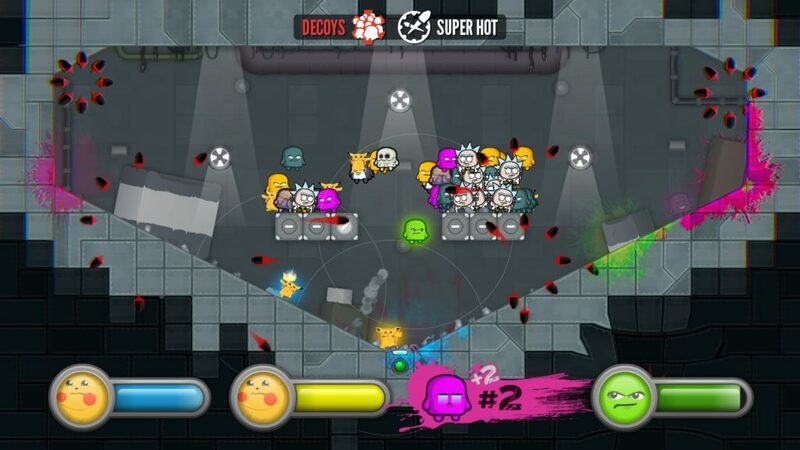 Move or die is a fast paced 4-player local and online party game. In this game, you’ll be facing three other players in a series of party games. Each game will only last twenty seconds and in this time, you try to survive and win. These games will vary between a lot of different party games that are chosen by all four players before the match starts. After everyone has chosen five games, these games will be chosen randomly each time. When a match has started, there’s not much time for breaks as it will continue until the end has been reached of the match. In-between games, you’ll have around five seconds to see what the next game will be and to prepare yourself. This requires you to pay close attention at the end of each game because the next one will start after a few seconds and you’ll have a very short time to see which game it is and what the rules are. Each game will have its own goal and rules. There’s a reason this game has the name ‘Move or Die’. Each player has their own health bar, and this will drain when you are standing still. You need to keep moving around to keep your health up. If your health drops to zero, you’ll die. It can be very tempting to stand still between falling blocks or when the floor disappears around you. The problem is that if you stand still, you’ll die and when you run around, you’ll risk making mistakes. This combined with the various games offers a funny and intense experience in a battle for victory. This experience gets even more fun when you play with good friends. Winning a match depends on the rules chosen at the start. 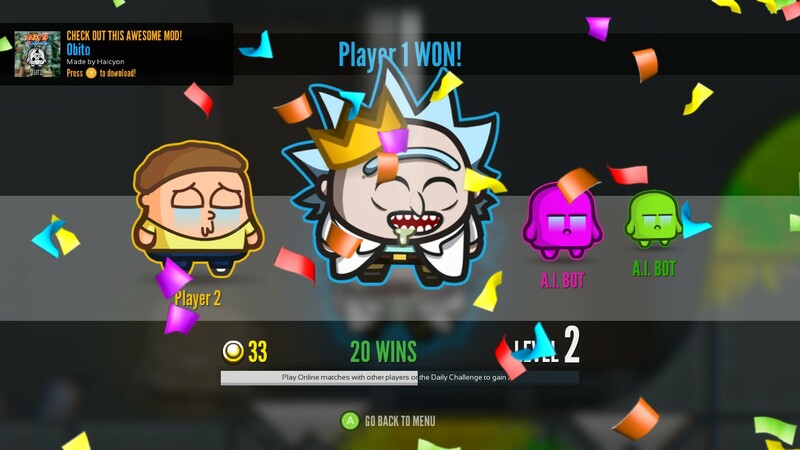 You can choose to play for a certain amount of time like ten or fifteen minutes and after that, the one with the most wins will win the match. When playing for fifteen minutes, the total amount of games played depends on how fast each game ends. It can occur that some games will end in seconds as you can die fast in some games. For example, in the game ‘Falling Blocks’, you’ll need to dodge incoming falling blocks and the last one standing wins. If three of the four players are hit by a block in a few seconds the last one will win very fast. The match will keep moving on and start a new game right away. In some games, the maximum of twenty seconds will be used up, like in ‘Color Craze’ you’ll need to dye blocks in your own color as much as you can. By touching blocks, they’ll become your color. If someone else touches those blocks, they’ll change. This game requires you to have the most blocks in your color at the end of the countdown. This can also get very frustrating when someone follows you. This will turn your blocks instantly to your opponents’ color. These matches get even more intense with mutators. These mutators will be chosen by one random player each five games. These add more rules to the games like the players being invisible or making other players jump by turning around while not being able to jump yourself. These added rules add even more variety to the game, and it can make every party game different with each mutator. The mutators can also be game-breaking with some combinations. For example, in a race to the end of the level, if a mutator is chosen that will reduce your sight to a small circle, you will not be able to see what’s coming and this can make reaching the end almost impossible. This party game can be played by up to four people, online and locally. When played with some of your friends, this game can lead to a lot of funny and frustrating moments. This game is also accessible by many different people as the controls aren’t very hard to master. You can move to the left and right and you can jump. In some games, pressing the down button on your controller or keyboard will also act as an activation button, like in the game ‘Jump Shot’ where you’ll need to jump and shoot the other players. Move or Die is fun party game to play with friends on your coach and online with other random players. 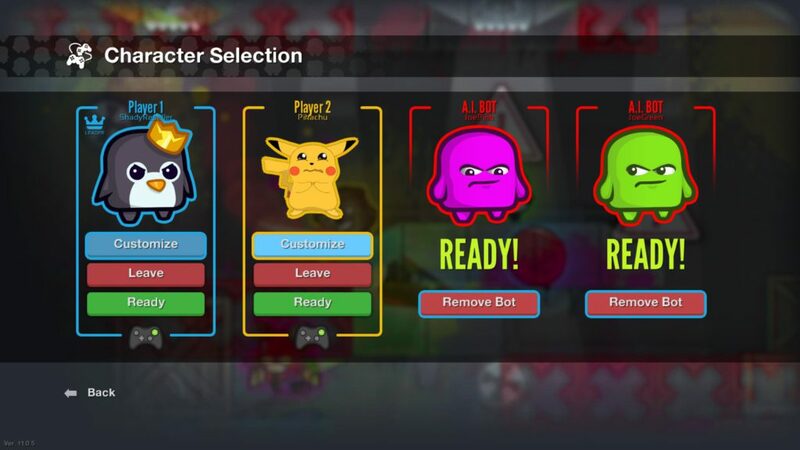 This game requires you to adapt quickly to each new game mode to best your opponents. It offers a lot of different minigames that can be enjoyed by many. The only downside of this game is that it’s a PC title and you’ll need three or four controllers to play this with friends on your couch. This will require you to have that number of controllers and a way to connect them with your PC. If you’ve solved that problem, you’ll have a great game that will be a success at almost any party. It will set you up against your friends and can even break friendships in the cruelest way (most good friendships will handle it). If you own a PC and have some controllers to connect with it, this game can definitely be worthwhile to get for some fun with your friends.